NEW WRITER'S GUIDE FEATURES IN THE STIRLING OBSERVER! 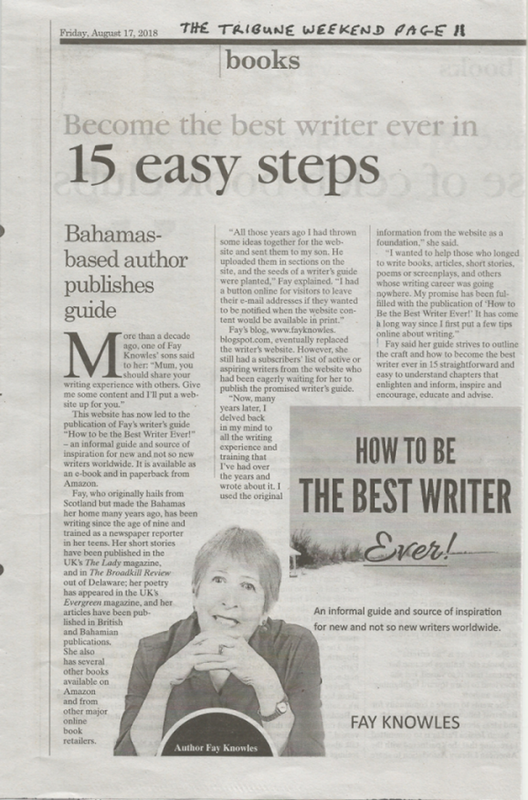 “The Stirling Observer”, Scotland, ran a nice piece about my new writer’s guide “How to Be the Best Writer Ever!” in their August 22, 2018, edition, page 13. 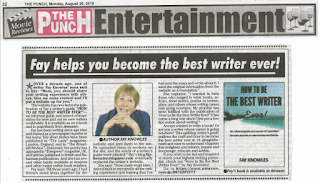 PUNCH FEATURES "HOW TO BE THE BEST WRITER EVER!" 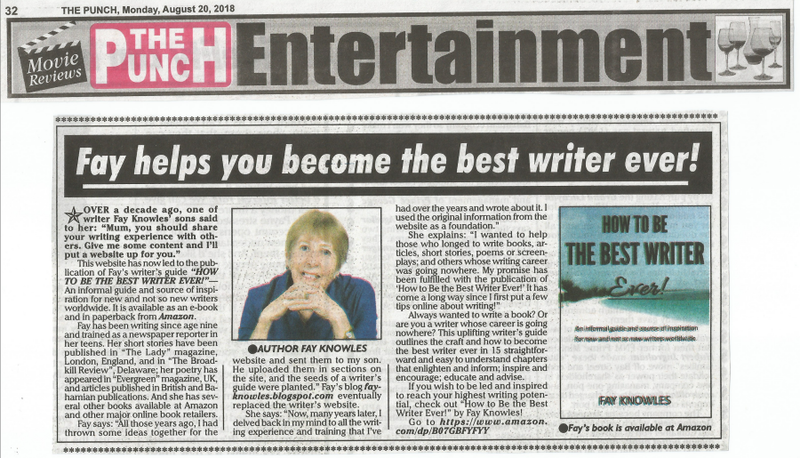 My writer’s guide “How to Be the Best Writer Ever!” made The Punch today! Learn how to overcome writer’s block and rejections. Delve into lists of helpful writers’ resources. Be shown how to submit your work, with clear graphs that you can use to keep track of queries and submissions. Find out where ideas come from and how to handle your writing time. See how to get paid for your writing. Receive the encouragement you need to be a successful writer, no matter your age. Be led and inspired to reach your highest writing potential! TRIBUNE WEEKEND EDITION FEATURES NEW WRITER'S GUIDE! In my writer’s guide you can learn how to overcome writer’s block and rejections. Delve into lists of helpful writers’ resources. Be shown how to submit your work, with clear graphs that you can use to keep track of queries and submissions. Find out where ideas come from and how to handle your writing time. See how to get paid for your writing. Receive the encouragement you need to be a successful writer, no matter your age. Be led and inspired to reach your highest writing potential! CLICK HERE for How to Be the Best Writer Ever! WRITER'S GUIDE A LONG TIME COMING! I put my whole being into my writer’s guide, “How to Be the Best Writer Ever!” It was a long time coming, but I finally wrote it, finished it and it’s just been published on Amazon as an e-book and in paperback. It will also be available at other major online book retailers. In a way, I feel it’s my biggest writing accomplishment so far. Now you too can be inspired to reach your highest writing potential! 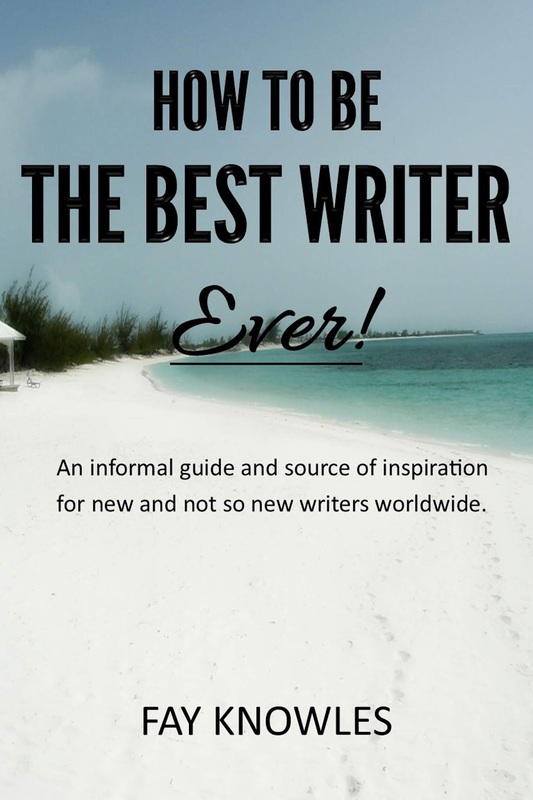 This uplifting writer’s guide outlines the craft and how to become the best writer ever in fifteen straightforward and easy to understand chapters that enlighten and inform; inspire and encourage; educate and advise. NEW WRITER’S GUIDE JUST RELEASED! 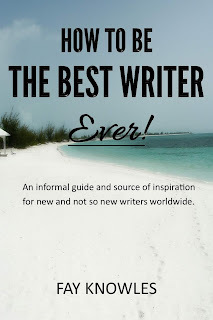 I am thrilled to announce the release of my new writer’s guide “How to Be the Best Writer Ever!” This is an informal guide and source of inspiration for new and not so new writers worldwide. “How to Be the Best Writer Ever!” is available on Amazon as an e-book and in paperback. I threw some ideas together and sent them to my son. 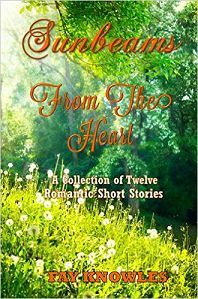 He uploaded them in separate sections on a website, and the seeds of a writer’s guide were planted. I had a button on the site for visitors to leave their email addresses if they wanted to be notified when the website would be available in print. 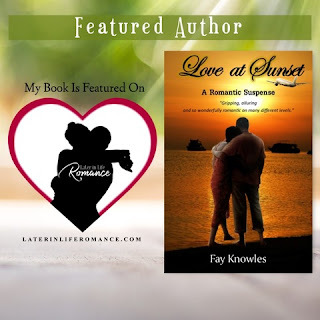 This blog eventually replaced the writer’s website. 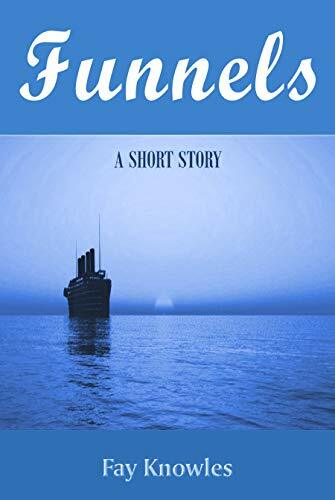 However, I still had a subscriber’s list of active or aspiring writers from the website who had been eagerly waiting for me to publish the promised writer’s guide. Now, many years later, I delved back in my mind to all the writing experience and training that I’ve had over the years and wrote about it. I used the original information from the website as a foundation. 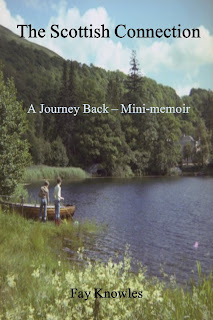 I wanted to help those who longed to write books, articles, short stories, poems or screenplays; and others whose writing career was going nowhere. My promise has been fulfilled with the publication of “How to Be the Best Writer Ever!" This has come a long way since I first put a few tips online about writing! If you wish to be led and inspired to reach your highest writing potential, you can get “How to Be the Best Writer Ever!” HERE!